Esta Noche/TONITE: Saturday, August 29th! This week, Radio Cuba Canta broadcasts a special tribute commemorating the 90th Birthday of “El Barbaro del Ritmo”, Benny Moré! Broadcast veteran and Cuban music historian Emiliano Echeverria will present his rare and vintage collection of Benny Moré, from his earliest recordings with the Conjunto Matamoros in 1945 to his final recording made in his home a few weeks before his death in 1963. 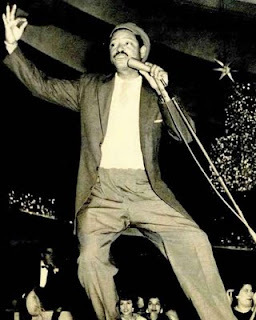 We will feature Benny with popular orchestras of the late 40s and early 50s in Mexico and Cuba, including Rafael de Paz, Mariano Mercerón, Conjunto Humberto Cane, Ernesto Duarte, and, of course, Damaso Perez Prado. In addition, we will feature Benny’s Banda Gigante in both studio and live settings, as well as seldom heard recordings from early in Benny Moré’s career.